With a crisp breeze in the air and a desire to wear a heeled boot, I donned several layers for day 24's chambray look. 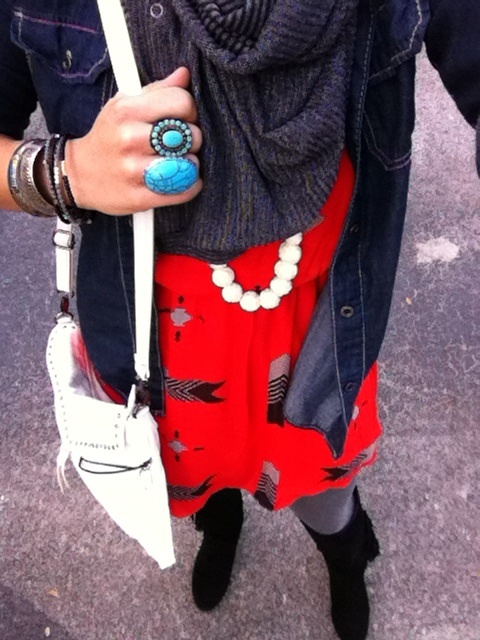 I was inspired by the color palette of the aztec print in the dress and wanted the red to pop on it's own so I kept my layers in black and grey. I used a pair of grey tights and my tall, black fringe boots on the bottom and my dark denim shirt and grey and black striped vinyasa scarf (lululemon) on the top. I used a silver studded, white cross-body purse to lighten the look and turquoise rings to keep the look playful. I recommend trying red and turquoise together in your own way and to find just the right balance between this warm and cool color pairing.